The Icon Hover Template is the perfect tool for adding graphics and other visuals to your eLearning courses. Combining text with images is not only fun and engaging for your Participants, it’s also effective! The Icon Hover Template is the perfect tool for adding graphics and other visuals to your eLearning courses. 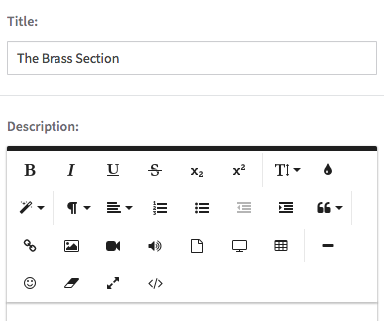 Step 1: Select the Icon Hover Template from the ‘Presentation’ panel. 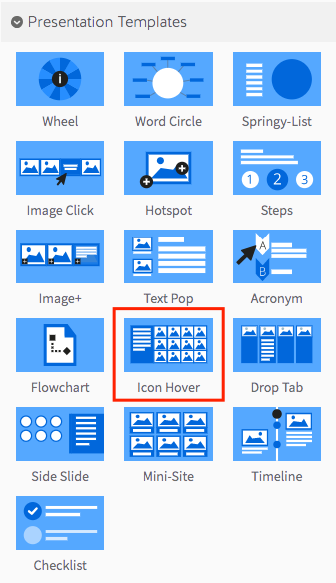 Step 2: Drag your Icon Hover Template into the Lesson Pathway. Step 6: To start building your Icon Hover Template, select the green ‘Add New Item’ button. Step 7: Choose your image and enter a title and description for it. For more information on using the ‘Add Image’ button, click here. Image Tips: The Icon Hover Template will also display a maximum of 4 images in a row. Whilst your image size is dependant on your content matter, we recommend beginning with images that are 210 x 150 pixels in size.